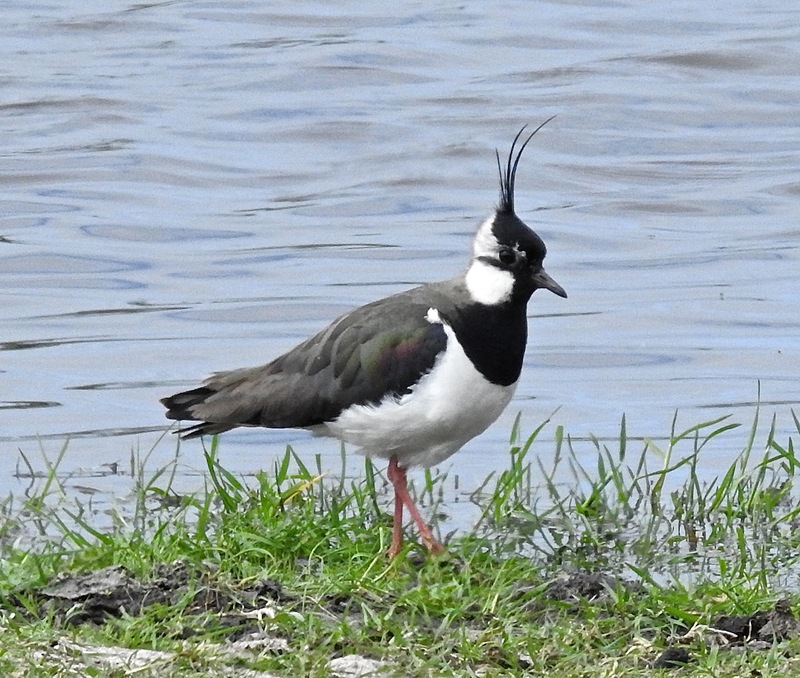 Spent the afternoon trying to will a few more waders onto the lagoon at Nels without success. 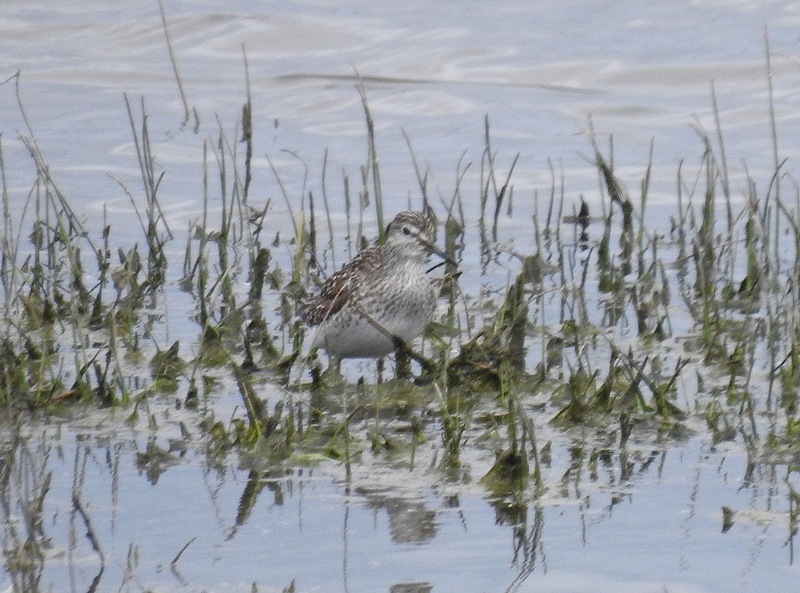 A Little Stint was with the Dunlin. Earlier Ron Jackson had two of the titchy critters there. 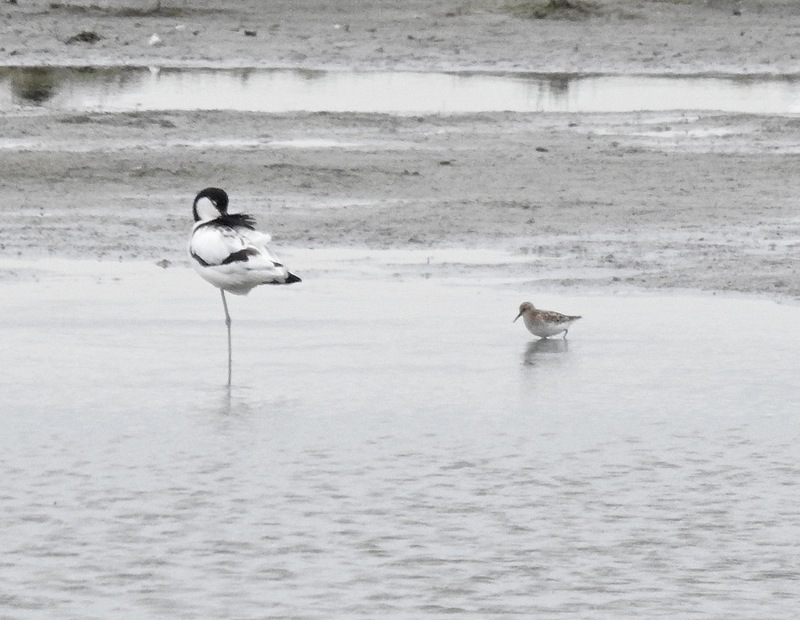 At least two large, winter plumage-type long-billed race Dunlins in the flock, and a single Ruff and Curlew dropped into join the Ringed Plover, Blackwits and Avocets etc. The Stint never really came close enough, preferring the far side of the lagoon, but it looked nice and crisp through the ‘scope. Yesterday Whitethroats were taking on that “dragged through a hedge backwards” look at Lunt, with the Lapwings there a bit more presentable. HOM was also quiet over the hot high tides before the weekend, although the super-elegant Arctic Terns there helped pass the time. In happier days the late, great Eric Hardy would refer to Martin Mere in print and on the wireless (anyone remember the “wireless”? 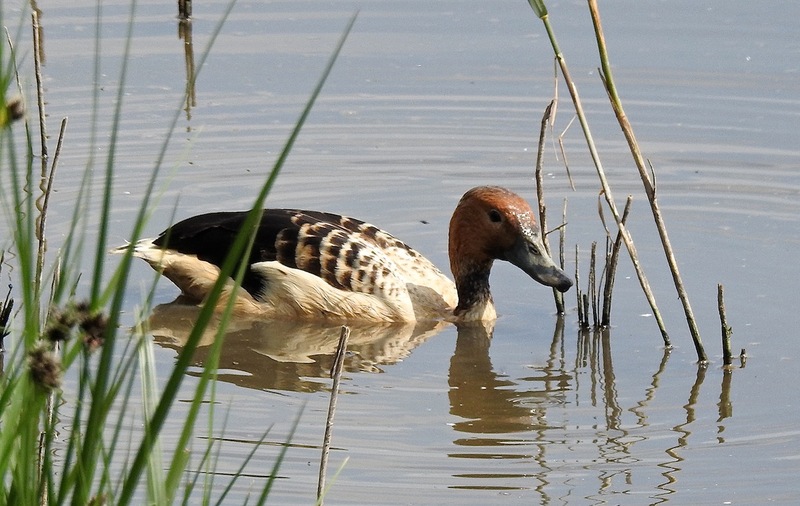 ), using not-so-shorthand as “Janet Kear’s duck brothel”. 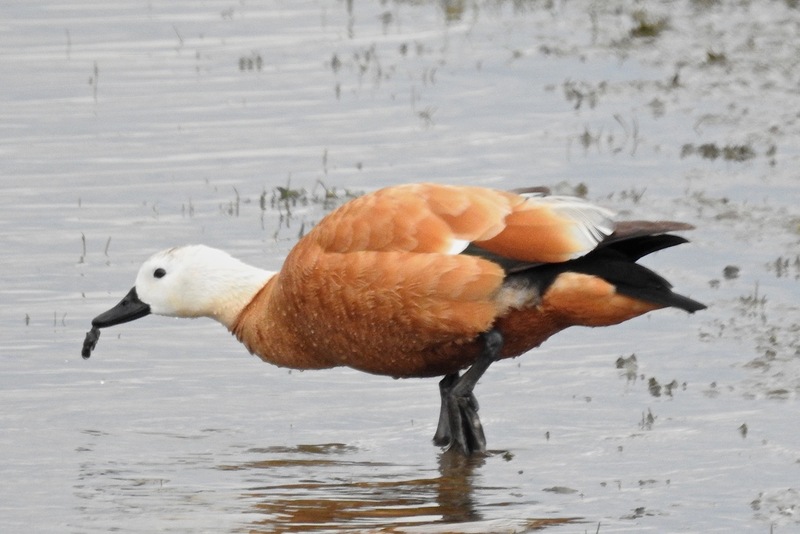 Hardy would have had a wry smile on his face today then as a Whistling Duck (probably Fulvous, but not quite right with those oh-so-pale undercrackers), rocked up at Nels at Marshside to join the ranks of ignominy alongside the Cruddy Shelduck, Golden Pheasant and the Little White Goose (among others). I didn’t see the whistler fly for most of the two hours I was at Nels in the scorchio today, but judging by those ridiculous blue splitty-splatties it could easily have walked in – thanks to Bazzo for the tip-off, if that’s the right term in relation to such a surreal arrival at the marsh. 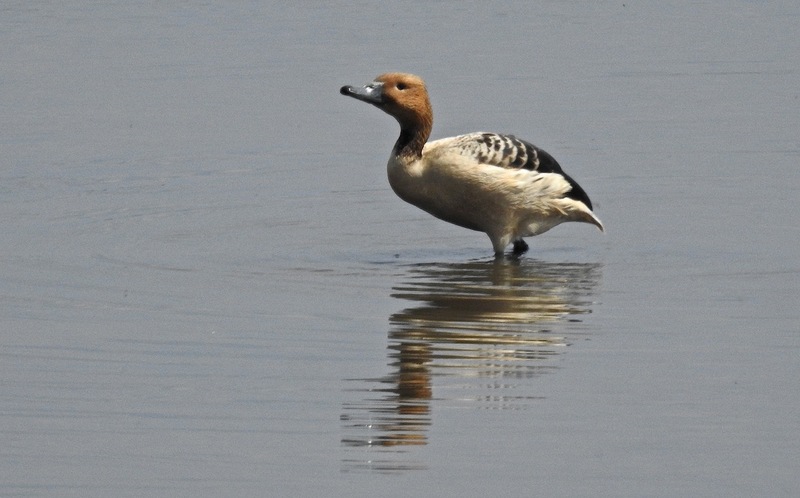 To be fair, the bird did fly a short distance later on, and looked quite bewildered by the experience, otherwise it slept a lot, then went feeding in the shallows like a deranged submarine Shoveler, it’s neck underwater diver-stylee as it thrashed about in the gloop with its bill. 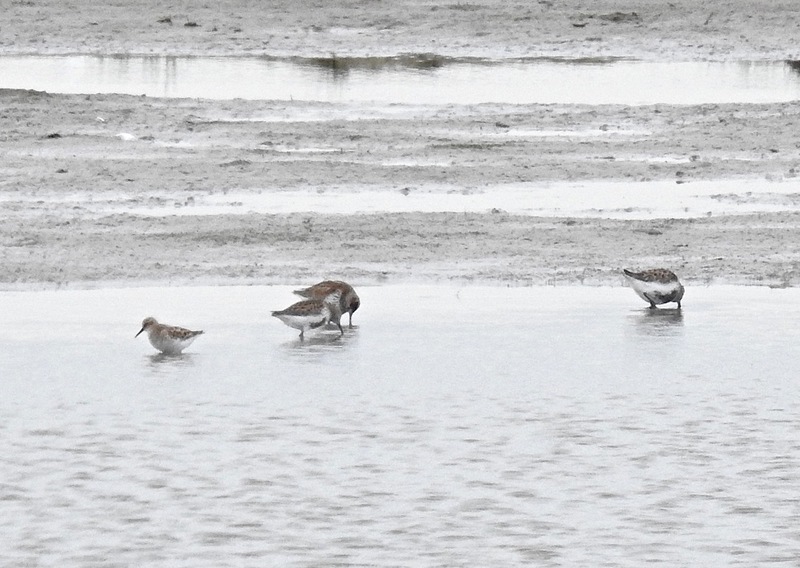 Far more sensible observations today included two winter plumage Knot amongst the Black Tailed Godwits from Nels, eight Dunlin and a Golden Plover. Sprawk and Common Buzzards sparked a few dreads and a surprise Painted Lady butterfly tottered south past the hide as I digested my latest helping of plastic. Plenty of giggles padded out the hours when spring Spurn fever failed to kick in today after Neill picked up myself, Andy and Jason and raced over to the east coast. Drizzle and cloud giving way to bright, warm sun in May – surely the old place would come up with the goods? 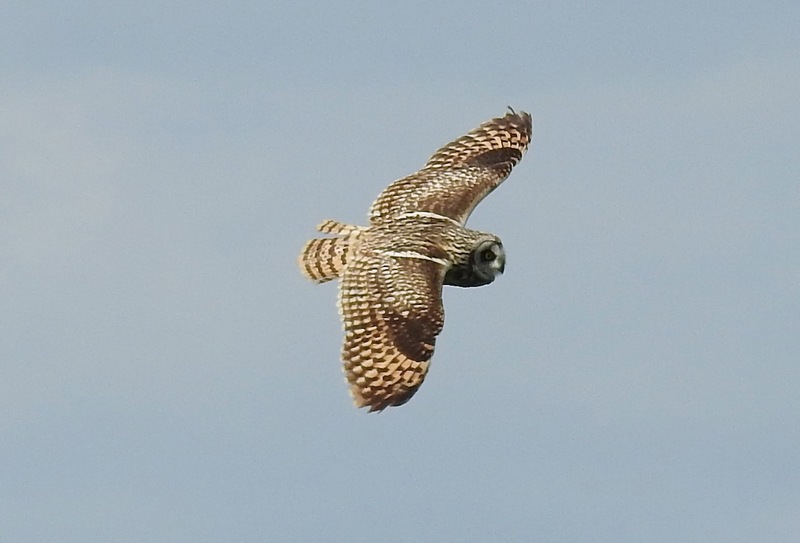 We overtook a hunting Barn Owl out near the Broom’s Cross road, before slipping into warp and were pulling up near Sunk Island for 9am. 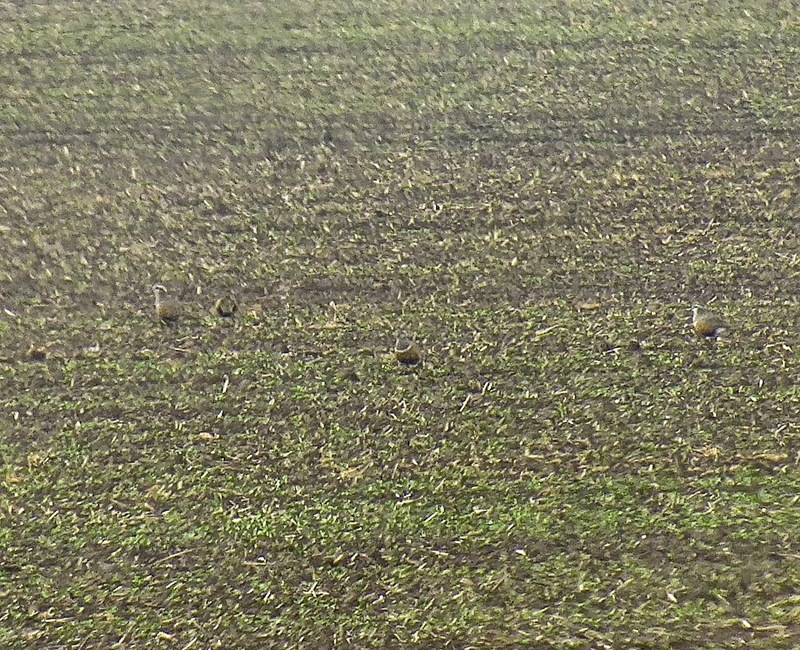 After a bit of soil scouring, a gorgeous trip of seven Dotterels gave themselves up as Skylarks, Cuckoo and Whitethroats sang. Brilliant. 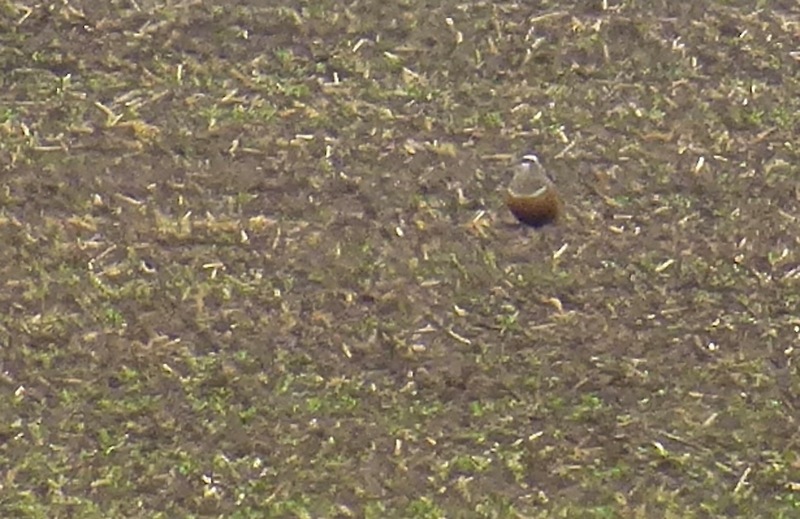 As ever, despite the lovely colours, the Dotterels could melt into the soil of the field remarkably well, their presence betrayed only by their dark bellies and shocking white supers, that met in a stunning “v” on their napes. 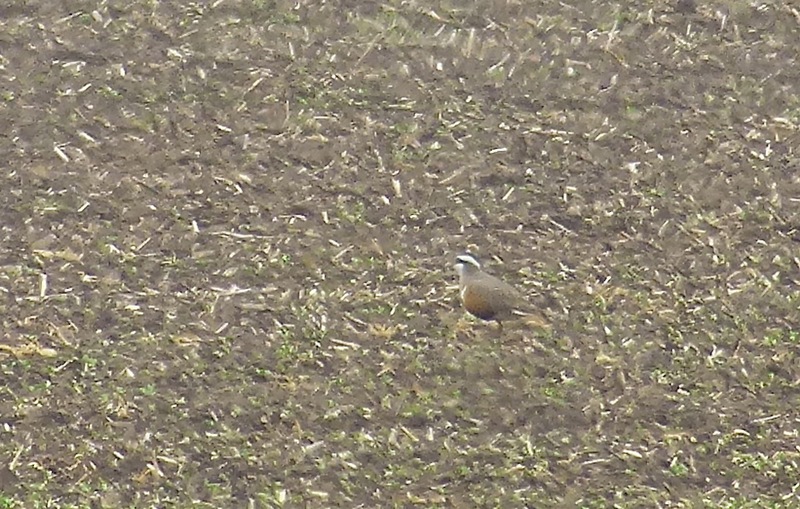 Superb scope views as they fed, but too far away for anything but blurry long range zoom pictures of one of my favourite birds…it was a relief to see them as another season of checking Plex on an almost daily basis comes to a close again without Dotterel joy on this side of the Pennines. 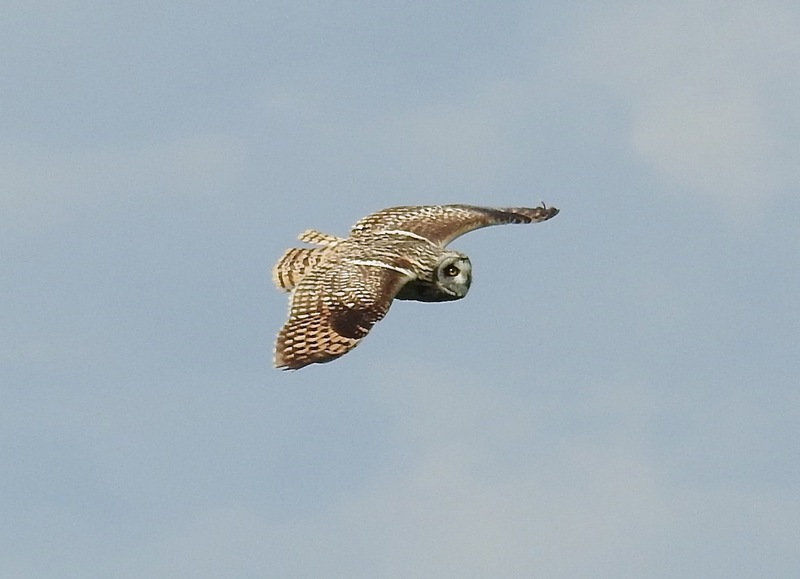 At least two full adult females in the trip, it was so good to see ’em again, who cares if they were too far off for the camera? 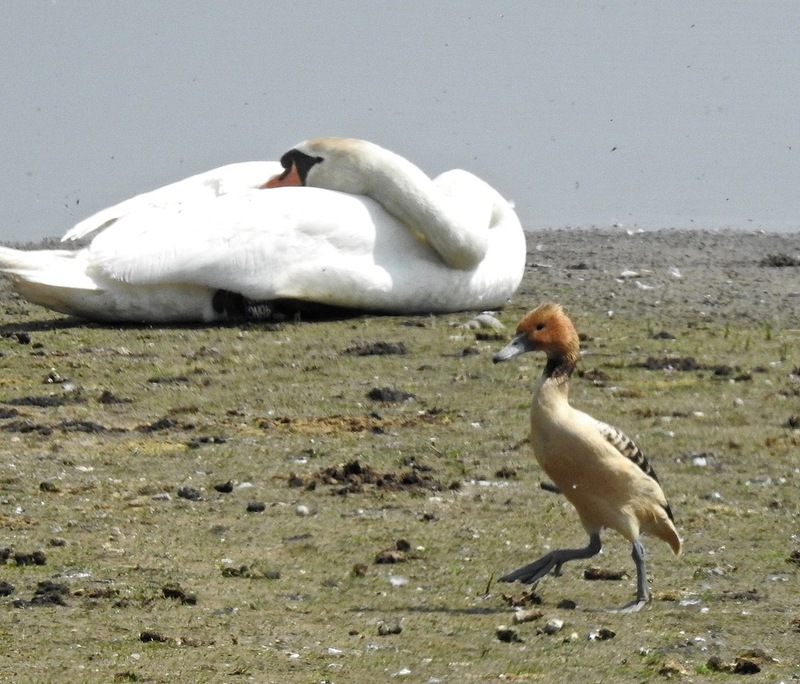 Moving round to Sammy’s Point it was quiet – a few Brent Geese on the Humber, Whitethroats, Sedgies etc, although two ringtail Hen Harriers circling south raised hopes for a raptor day. 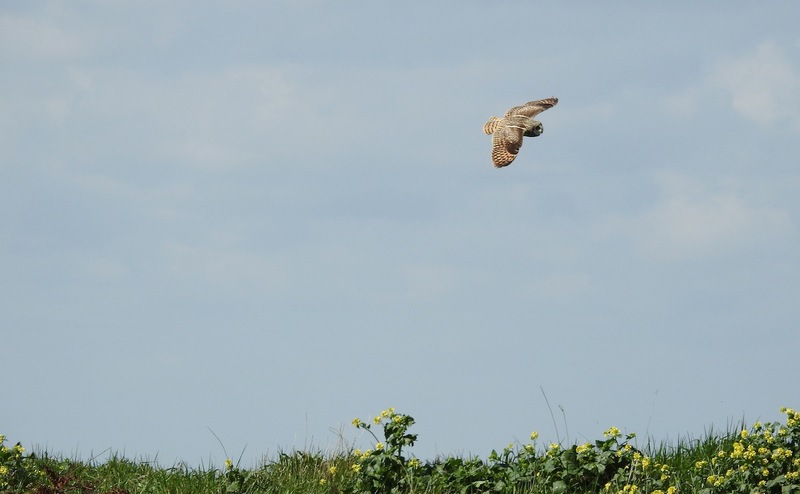 A dirty great Short Eared Owl hunting the bank opposite Kilnsea Wetlands also hinted stuff was on the move, a joy to watch as it patrolled in the bright sun. 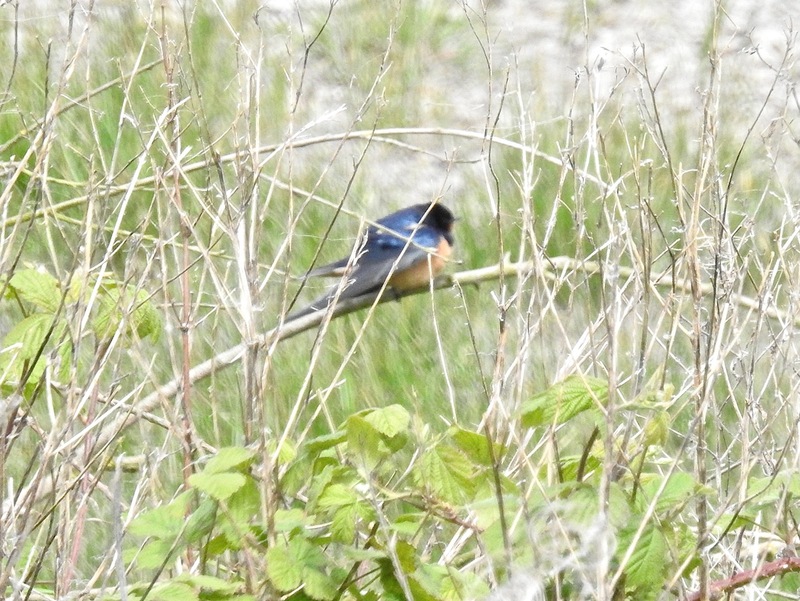 But after that the wheels fell off a tad – Beacon Lane had Lesser Whitethroat, Brimstone, Wall Brown and Orange Tip butterflies, and a few Wheatears were around a traumatically gussied up Canal Zone car park. Little Terns scooted out to sea from Beacon Ponds and another Cuckoo was calling but other than that it was quietening down, apart from a steady hirundine movement south, so we pulled out and headed into the desolate, perplexing and altogether daunting massif of Thorne Moors on the way home. The sound of duelling banjos is still echoing in me head. Couldn’t let all that lovely drizzly rain go to waste, so I went for a quick walk around Sands Lake at Ainsdale after work this evening. 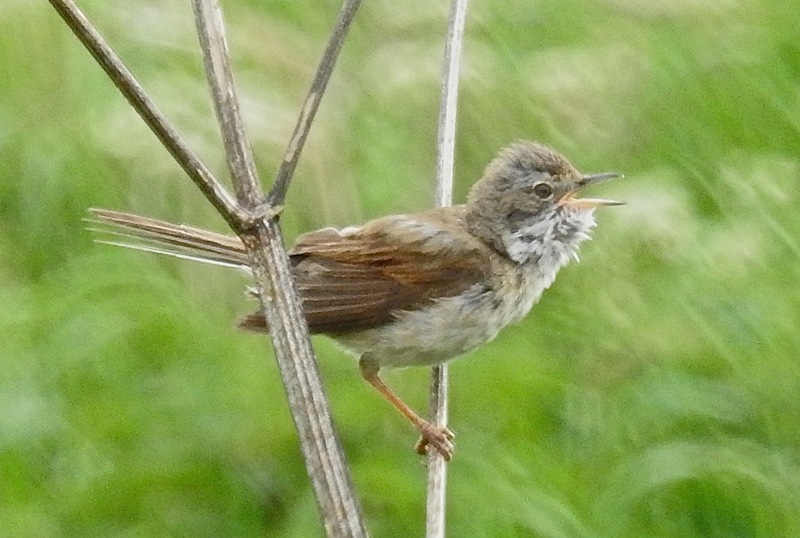 Willow Warblers, Chiffies and Blackcaps still singing away and a Common Sandpiper whirring around the edges (but there’s been one there for a week or so now) in the humid conditions. 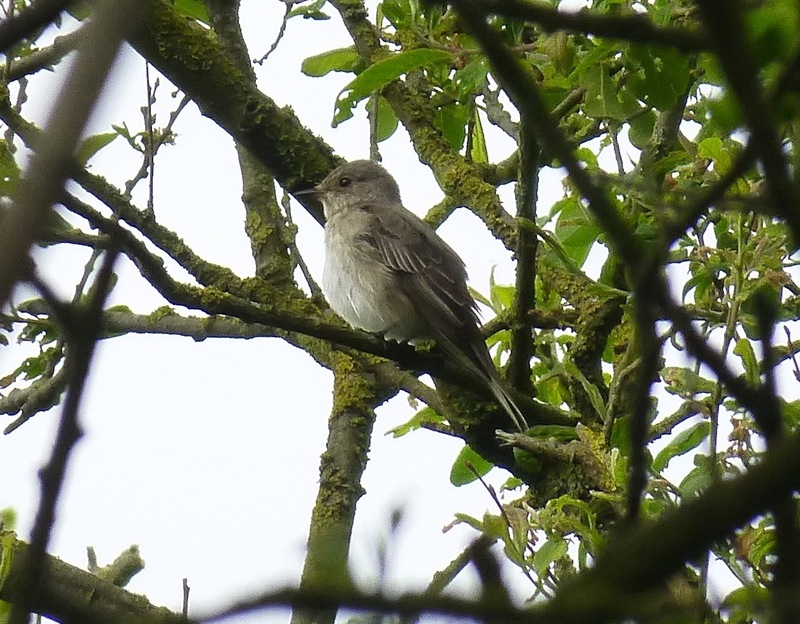 A darting shape in the canopy up at the top end revealed what I was hoping for – a fine Spotted Flycatcher. 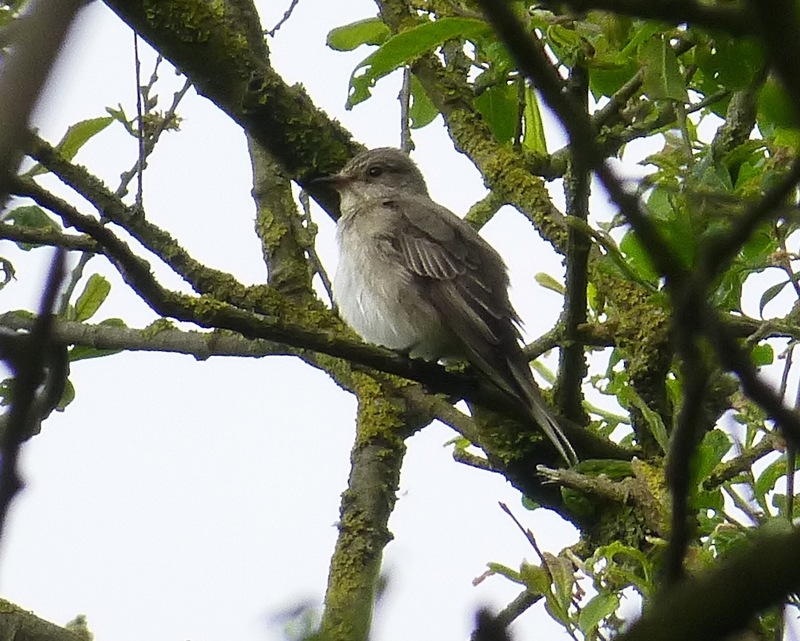 I know Spot Flys are meant to be zippy by trade, but even by flycatcher standards this one was particularly hyperactive – every second or two it set off on circular forays above the trees, I could barely keep me bins on it! 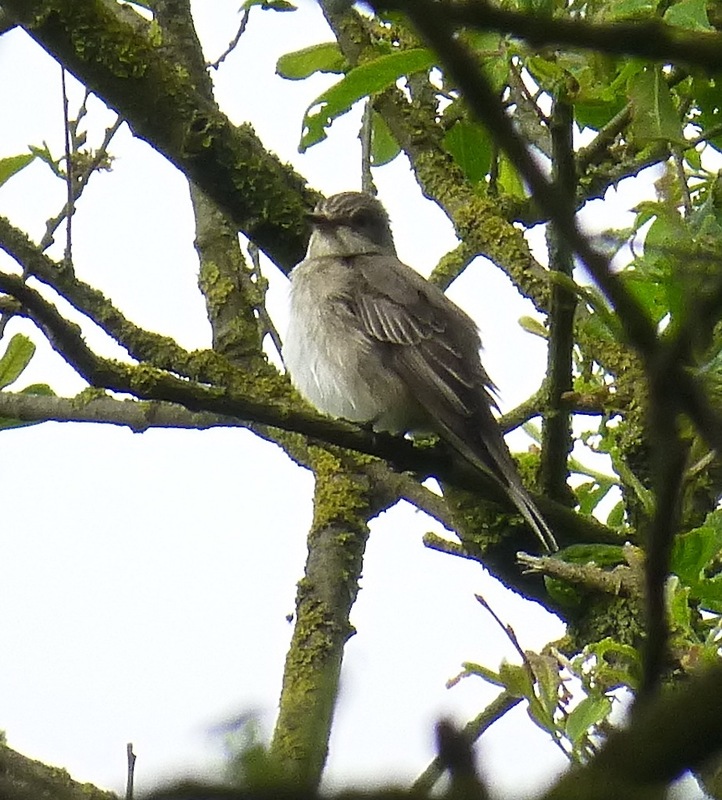 It was a good ten minutes before the bird had one of those “still periods” flycatchers seem to enjoy, as if they’re pondering how much energy they expend just to get tea. 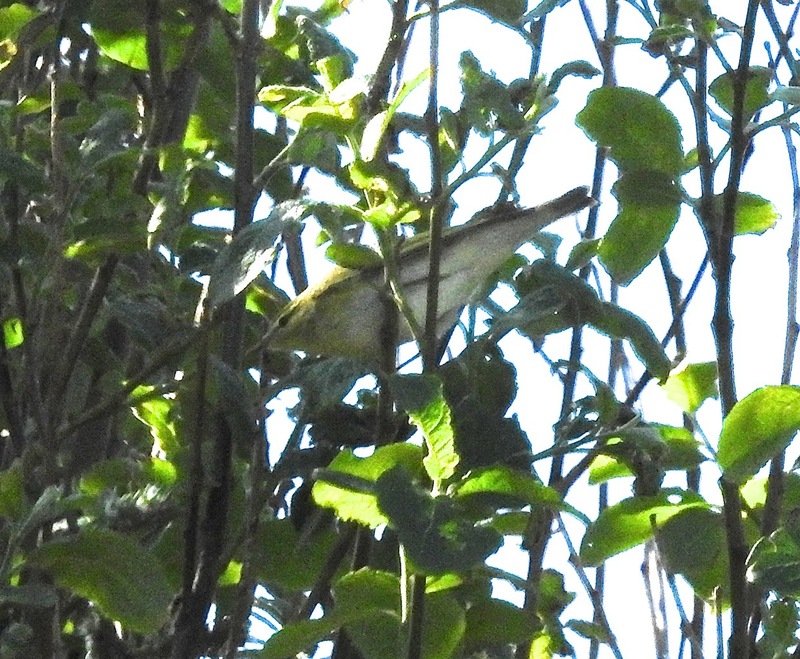 I managed to get a few point and press shots of it through the branches before it zoomed off through the leaves again. Today is a bit like that sequence in “Goodfellas” just before the DEA/ATF come crashing through Ray Liotta’s door (except without all the naughty stuff of course) – I had to check a party of visiting archaeolgists were safely ensconsed on the coast, get the missus to a concert she’s playing in this afternoon, then pick up Mrs D’s folks and my mum and get them to the concert, find somewhere to park in Southport on the hottest day of the year, pick up some shopping, …and there’s two singing Wood Warblers at Marshside on the golf course (and naturally there’s a golf tournament on). Thanks to Playful Pete Allen and Alan Wright sending updates I was able to detour to the marsh and catch up with one of the lemon sherbet heads as it spluttered away by the public footpath along the bank. 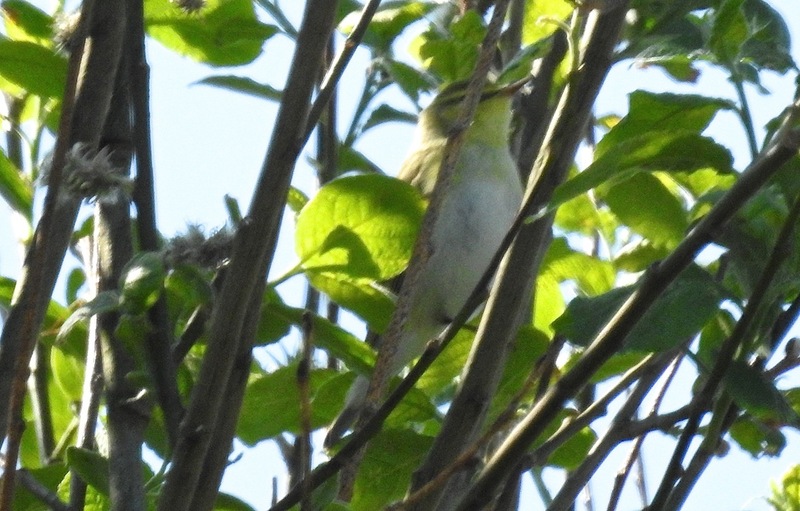 As Shaun Ankers and I tried to get glimpses of the Wood Warbler in the shade of the sun-blasted canopy, a Lesser Whitethroat started cranking up behind me, so close I could almost hear it draw breath between rattles – where to look? 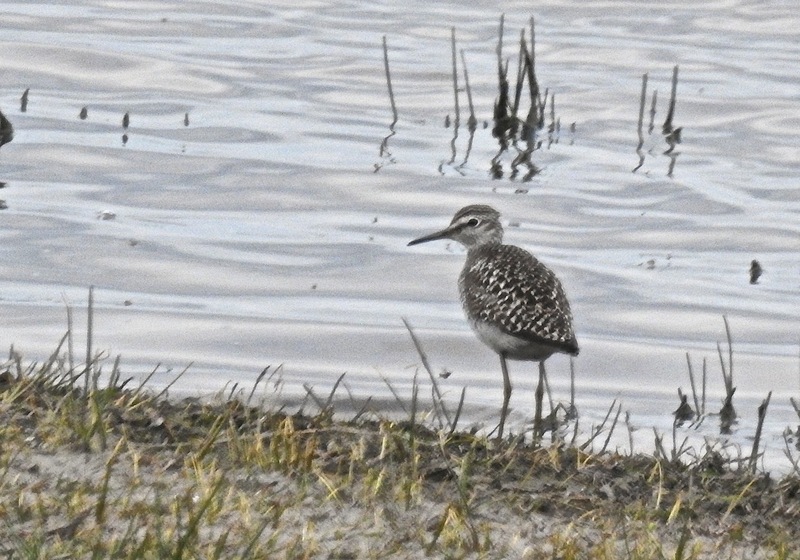 Lovely to be spoilt for choice on the marsh, and the Wood Sand was still on Fairclough’s Pool. Right back to concert taxi duties – you know it’s getting busy when you try to open the fridge using your car key fob…hmmmmmmm!!!! Luckily the boss was just after making a sweet n’sour, so off I went. Naturally I took a circuitous route to the Kwik-E-Mart, heading to Marshside for an hour or two. “Mr Orange” was on the lagoon off Nels still, best observed from distance from Hesketh Road, so eliminating the need to look at incongruous detail close up, and the Swallow with the reddish wash to his undercrackers was whizzing about around the platform, perching up in the brambles occasionally. Way too zippy for me to get a proper piccy with rice wine on my mind. 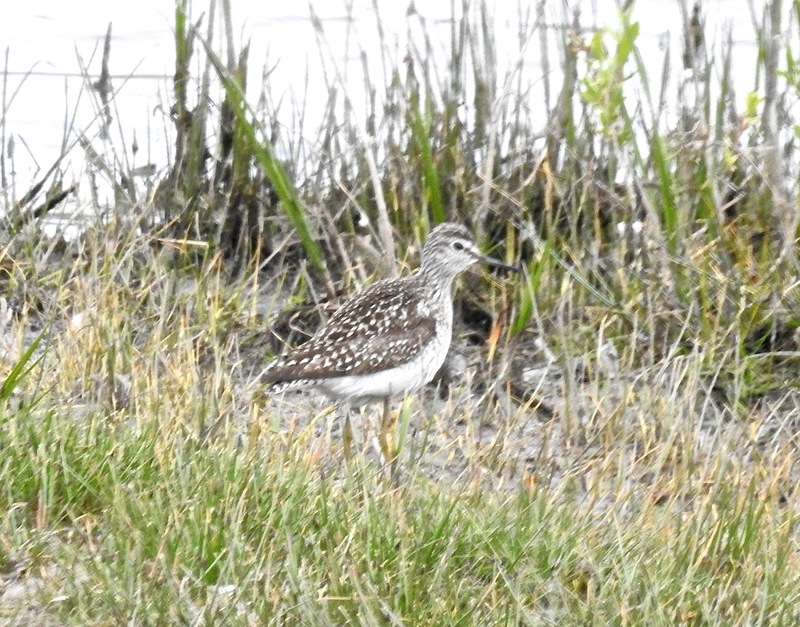 Much more restful was the Wood Sandpiper which fed along the water’s edge the whole time – a class act. Lots of Swifts through, and blasts of the Cetti’s from the SSSI ditch too. Time to head to the check-out. A pleasing hour or two on the platform at Hesketh Road today, scanning Marshside and enjoying a light, but steady bit of spring passage in the weakening south easterly with a shady gathering of ne’er-do-wells. 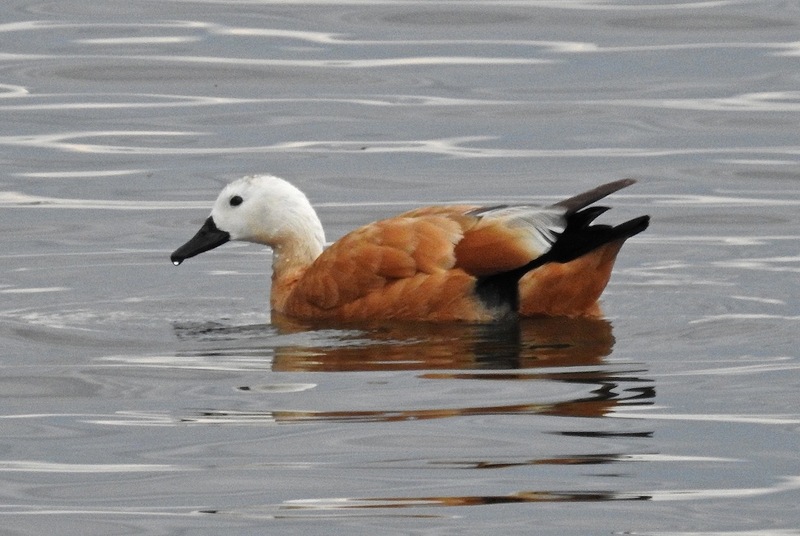 The lure that brought us all down was dodgy long distance year ticking of a Ruddy Shelduck, which was off Nels, but ‘scopable from the platform. These things, as with all wildfowl, are best viewed from a distance, but as we talked nonsense for an hour or so, some good birds went through – a heavy movement of hirundines and small parties of Swifts were arcing along ahead of the clouds, and a Hobby came steaming up from the south, before gaining height over Marshside and appearing to zoom off towards the Fylde empty-taloned. 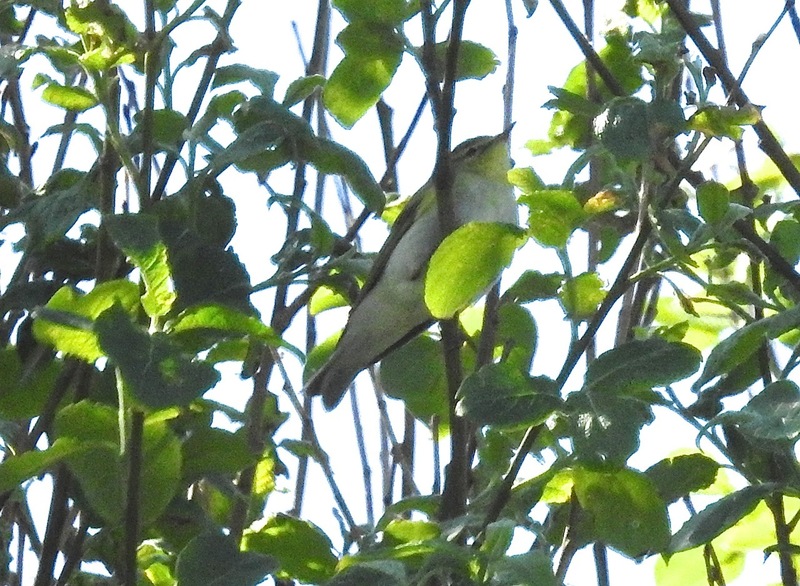 Gropper, Whitethroat, Cetti’s Warbler, Blackcap, Reed and Sedgies plus Willow Warbler and Chiffy were all singing and overhead Tree Pipit and Yellow Wagtail called on the way north, as did four trilling Whimbrels. A Brimstone butterfly tottered through (I had Orange Tip, Peacock and Small Tortoiseshell too) as Swallows gathered mud for nests beneath the platform. 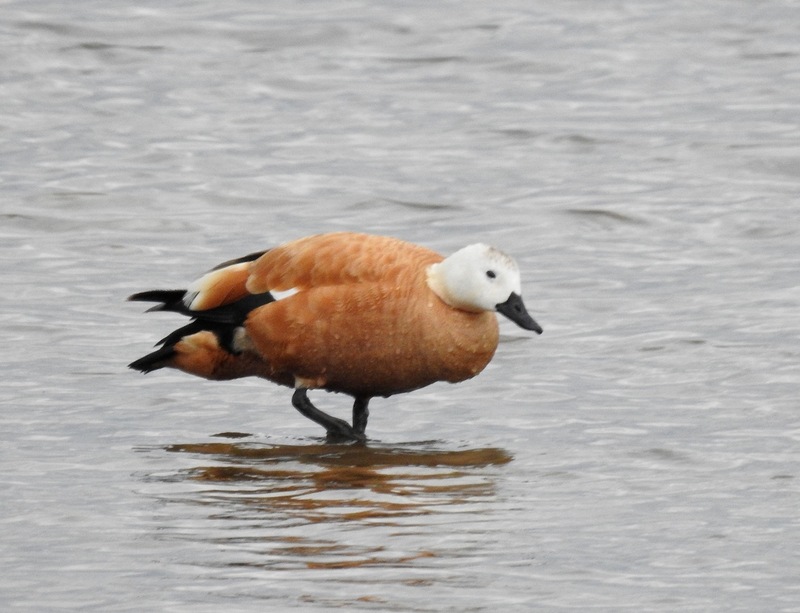 I wanted a better view of the Ruddy Shelduck and headed up to Nels, which was probably not the smartest of ideas – the bird came pretty close, and while I don’t have much experience with Ruddy Shelduck, it’s head looked very white, and it didn’t look quite right – a shame as there are only a handful of records for the marsh. 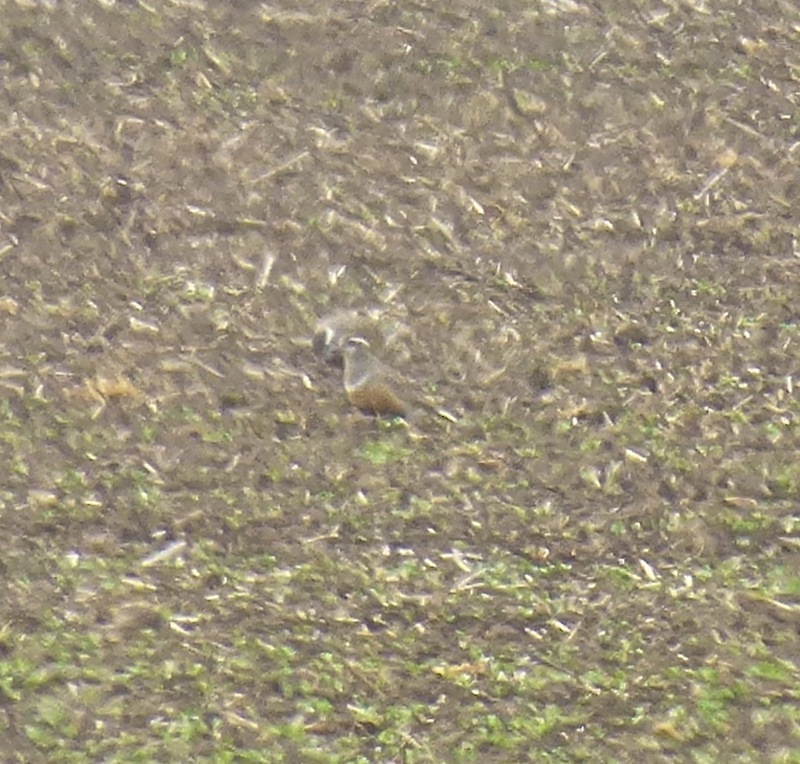 Could be a young bird I suppose, but even that shouldn’t look this white and what’s with the grey crown markings? What do other people think (go on, break the habit of a lifetime and leave a comment)? 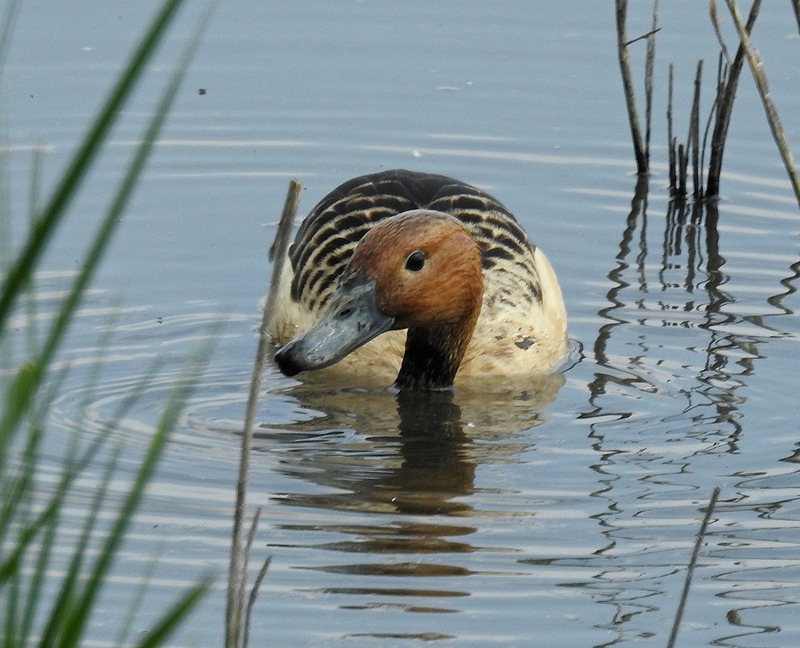 I’ve said it before and I’ll say it again, it often doesn’t do to look at wildfowl too closely. 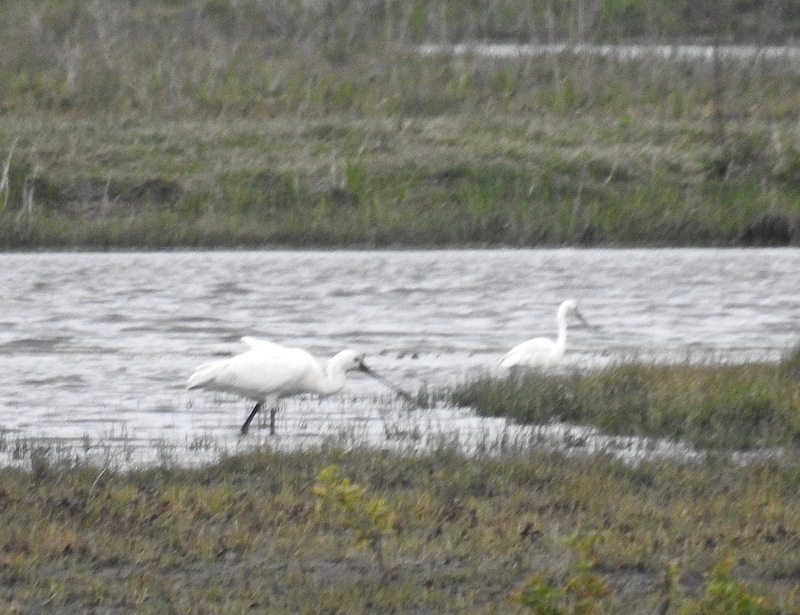 As I grilled the duck from Nels, Chris Fyles arrived and pointed out a Spoonbill to the north of us which I hadn’t noticed. 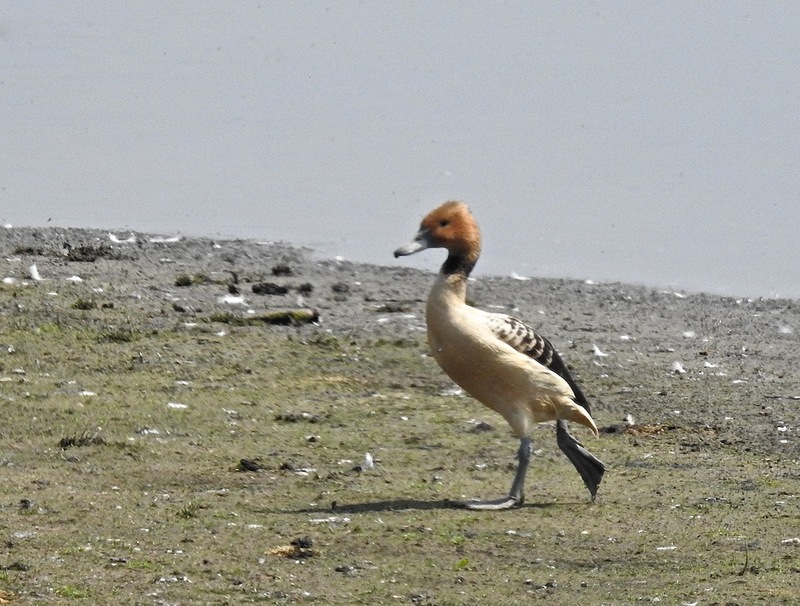 It didn’t appear to have an apricot breast-band, although it was a good way away – a new bird or just a trick of the light? Small parties of Dunlin and Ringed Plover were on the move, the Ruff were looking flashy, Wheatears were bounding about and the marsh felt like it was buzzing. 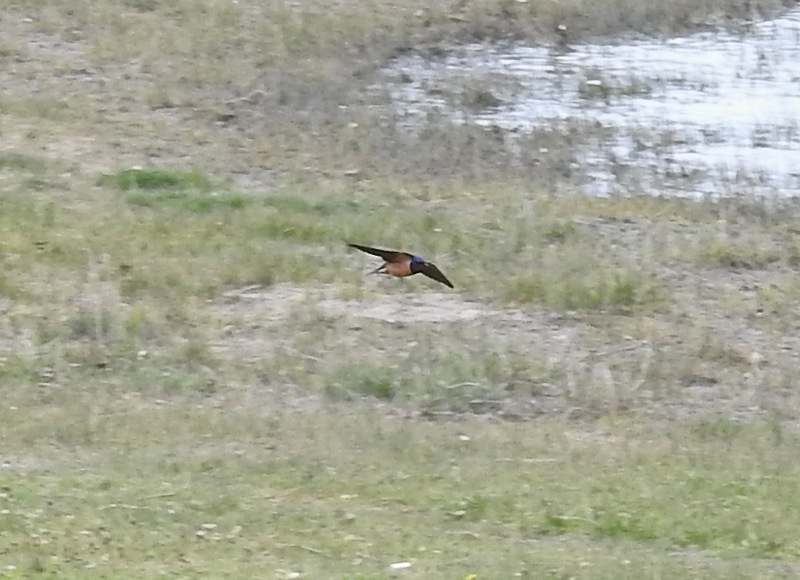 A Little Gull was feeding at the back of Marshside Two as I walked back to the car, and as I loaded my junk into the boot, a Cuckoo came speeding along low and purposeful, before disappearing behind the sandplant shrubbery.